Go check out all the newest additions in the Leafly strain database! We added some new OG hybrids, a classic Chemdawg variation, a…Dream Beaver (whatever that is), and many more. Submit a strain review for the ones you've tried or find out where you can find them near you by checking the links below! Phishhead Kush, named in homage to the American rock band, is an indica strain that was passed down from an older grower to the cultivators at The Clinic in Colorado. This heavy-handed strain descends from age-old Afghani indicas and inherits a spicy, woody aroma that comes to life when ground up. Heavy hypnotic effects lead the way, leaving both mind and body feeling blissfully pacified. Dream Beaver by Bodhi Seeds is a sativa-dominant strain that crosses Dirty Hippy (an Afghooey–Blockhead hybrid) with Appalachia. With subdued flavors of fresh cedar and earthy spice, Dream Beaver deals a mellow buzz that lets you stay active, productive, and social. This sativa is a great choice for unleashing laughing fits and creative sparks on those days when your mood and motivation could use a lift. 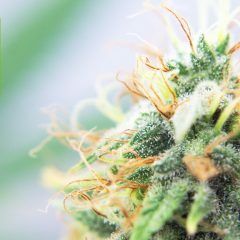 Durban Berry is a hybrid cannabis strain that harnesses the vitalizing sativa power of Durban Poison counterbalanced by the mellow indica qualities of Rocky Mountain Blueberry. Taking after her Durban Poison parent, Durban Berry delivers a functional and upbeat high that allows creativity to flow freely. A pungent lemon and berry aroma erupts from the fluffy buds while tangy citrus flavors awaken on the exhale. From Barney’s Farm comes CBD Critical Cure (or simply “Critical Cure”), an indica-dominant strain that’s said to combine Critical Kush with a ruderalis variety. Because this strain typically contains about 8 percent CBD and 5 percent THC, Critical Cure can annihilate pain, stress, and inflammation with little psychoactive interference. The indica influence in CBD Critical Cure gives rise to deeply relaxing effects delivered alongside a sweet, earthy flavor. Golden Ticket from Archive Seeds Bank is a 50/50 hybrid strain that gives you special access to euphoria’s top floor. Combining genetics from Golden Goat and Face Off OG, Golden Ticket balances full-body relaxation with invigorating cerebral qualities. Its aroma is an enticing mix of tangy lemon, sweet lime, and sour skunk. Keep in mind, Golden Ticket may also refer to a phenotypic variation of Chernobyl, a hybrid from TGA Seeds. Monster OG from The Green Element is a hybrid strain that crosses a heavy OG indica with an OG Kush and SFV OG hybrid. With a THC profile that can stretch past 26 percent, Monster OG’s effects come on strong to relax muscles, soothe pains, relieve stress, increase the appetite, and promote rest. Stout plants produce tights resin-packed buds that carry a blend of deep, earthy diesel and subtle burnt spice notes. 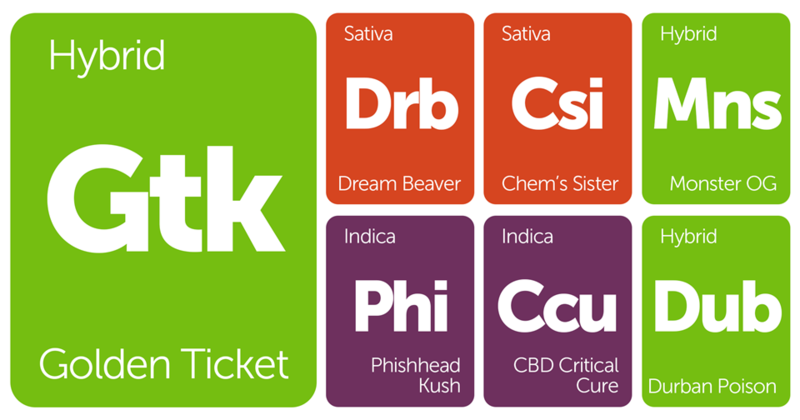 How Would You Describe 2015 Using Strain Names?